This will be a vape comparison between the Pax 2 and the Grasshopper dry herb portable vaporizers. Both of these vapes are considered my most portable units of the 60+ vaporizers I’ve tested but they function in very different ways. The Grasshopper is basically an on demand convection vaporizer designed and manufactured by Hopper Labs. This is their first product and so far it’s not uncommon for people to throw around the word “game changer” when talking about the GH. It heats up in seconds, features a full temp spectrum via a rotary dial and offers a replaceable rechargeable battery system. 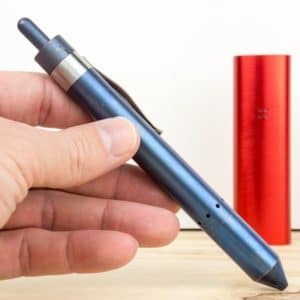 Unfortunately, the popularity of this vaporizer has overwhelmed this company for quite some time and they have been playing catch up for almost 2 years now. There’s no doubt in my mind that you would absolutely love the Grasshopper but if you ordered today, you probably wouldn’t see it for 4-6 months. They are however increasing production rates daily so it is possible that you might get it before then. Update: The Pax 3 ($249.99) is out now and the Pax 2 price is now $149. With the Pax 3 you get a quicker pre-heat (15-20 seconds), bigger battery (Now 3500mAh vs 3000 mAh Pax 2), Bluetooth, the Pax Vapor Smartphone App (full temp control 360F-420F) and the Concentrate Insert. The Concentrate Insert does works with the Pax 2 but I recommend the Pax 3 if you don’t own the Pax 2. The upgraded features and the concentrate insert make it worth the $70 difference. Hopper Labs have also increased shipping times and are now shipping units on demand. The Stainless Steel Grasshopper currently retails for $225 or you can pick up the Titanium model that weighs a bit less and is less prone to scratches for $265. Click the prices to check out the Grasshopper directly from HopperLabs. 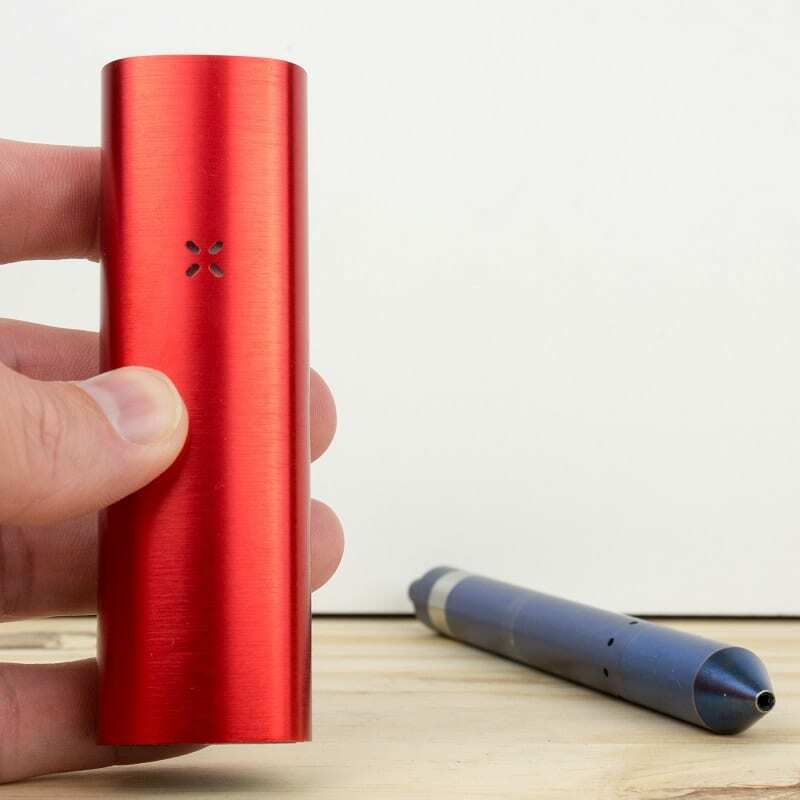 The Pax 2 is a conduction session vaporizer made by PaxVapor. This is the 2nd version of the Pax vaporizer and a HUGE improvement over the original, most noticeably in the cleaning and maintenance category. I consider the Pax 2 to be one of the most durable and reliable portable vaporizers currently on the market and I use it all the time outdoors because of that. The Pax 2 is my go to vaporizer for outdoor sports like MTB, skateboarding, hiking and skiing, especially if I will be using it in a group scenario. The larger chamber allows for a longer session with more people without having to re-pack half way through. The Pax 2 also creates much cooler vapor but at the price of increased draw resistance. The Pax 2 retails for $149 and I recommend picking it up direct from PaxVapor or via VapeWorld to ensure you get the 10-year warranty. 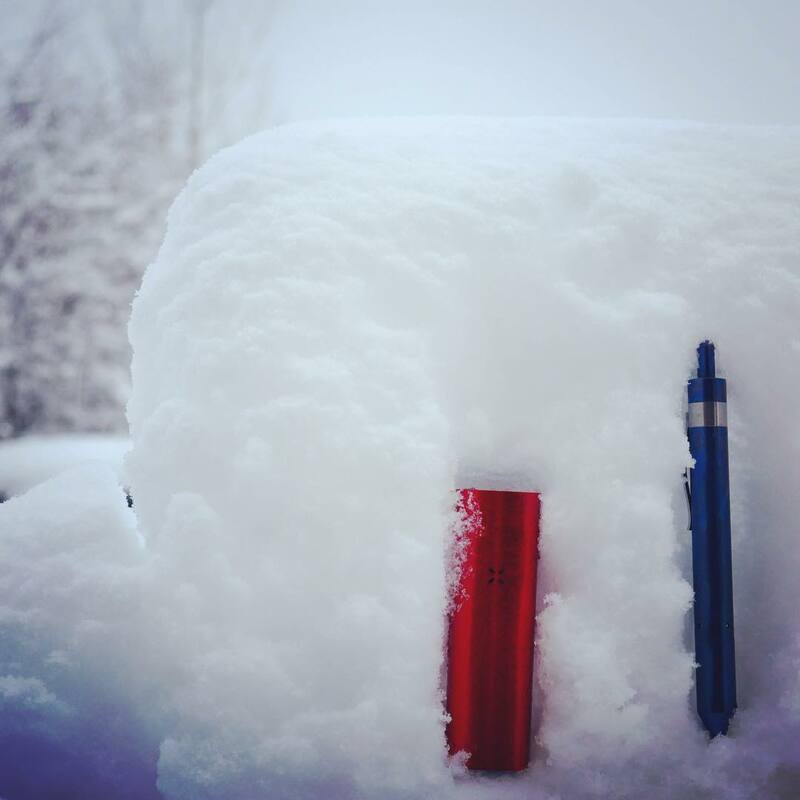 The exact dimensions of the Pax 2 are 3.87” tall, 1.21” wide and .08” deep. The Grasshopper is about 5.6 inches tall which and a half inch in diameter. The Pax 2 comes in at about 92 grams while the Titanium Grasshopper vape weighs roughly 55 grams. The Stainless Steel Grasshopper is around 67 grams. So both units are extremely portable and easy to pocket out on the go. The Grasshopper comes with a replaceable rechargeable Lithium-Ion 3.7v 750mAh battery. The Grasshopper is charged via a USB charger that attaches magnetically to the back of the pen. It’s a very secure fit and charges completely from dead in about 60 minutes. If you decide to go with the Grasshopper I recommend picking up an external charger and a couple extra batteries because you can only charge the batteries within the device. The extra batteries run $7/piece. The Pax 2 comes with a NON-replaceable rechargeable Lithium-Ion 3.7v 3000mAh battery. I average around 90 minutes of average continuous on a full battery and the Pax 2 will completely charge from dead in about 90-100 minutes. The Pax 2 battery life is actually really impressive for the size of the device but replaceable batteries would have been huge. You can always pick up an external Anker battery pack which will easily fit into a backpack or something of the sort for longer trips. The Pax 2 charges via a magnetic USB charging brick that attaches to the side of the unit. Unfortunately, the magnet isn’t the strongest so I recommend using a hair tie or a rubber band around the unit and charging station while you’re charging the device. So overall both units offer great options for charging and come with pretty decent overall battery life. The Pax 2 definitely has longer battery life but you can’t swap out batteries on the fly like you can with the Grasshopper. This really just comes down to personal preference and how you will be using your vaporizer. I’ve never run out of battery life with the Pax 2 but I’ve had to bring spare batteries on longer excursions. So I guess if you didn’t want to bring anything with you other than the vaporizer, the Pax 2 might be the best option, just make sure to fully charge it before heading out for the day. The Grasshopper chamber uses a type of 3d printed metal called direct metal laser sintering. This allows the Grasshopper to be extremely compact while still maximizing the efficiency of the chamber. The Grasshopper uses a 45-watt heater which can hit 410 degrees Fahrenheit in about 5 seconds and a stainless steel vapor path. The Pax 2 uses a stainless steel chamber and a stainless steel vapor path. The heating element in the Pax 2 is a thin film Kapton heater flex [1,2]. Typical heat up times range from 50-70 seconds depending on starting temp, herbs, environment, and packing style. The biggest difference here would be the draw resistance. The Pax 2 has quite a bit more resistance than the Grasshopper which I consider to be one of the most free-flowing dry herb vapes on the market. Really the only portable vaporizers better in that aspect would be the Crafty or the Mighty. The cleaning and maintenance is fairly simple on both units and the upgrades to the Pax 2 have actually made it one of the best units as far as cleaning and maintenance goes. The Pax 2 and the Grasshopper are both units that work best with daily maintenance. There’s really no huge breakdown and cleaning require to either the Grasshopper or the Pax 2. Just wipe out the chambers after a session, brush out the screen on the Grasshopper and run a cleaning brush through the Pax 2 vapor path every so often. I would say cleaning and maintenance is a tie. Summary: Should I buy the Pax 2 or the Grasshopper? So overall I think you can tell that I really like both the Pax 2 and the Grasshopper. I use each of them in different ways and at different times but either one could be a daily driver for all of my activities. The portability and concealment on both units make them favorites for outdoor concerts, beach days, or really anything that you might need to be a little sneakier about. If I personally had to choose the Pax 2 or the Grasshopper, I would probably go with the Grasshopper if I could wait and if not, I would go with the Pax 2 now. Although I think the Grasshopper is much more unique and the better portable vaporizer overall, you’re currently looking at 4+ months before you would possibly see your Grasshopper and if we’re being real, I’m not a very patient person. -The Pax 2 is currently $150 and the TI version of the Grasshopper retails for $265. -The Grasshopper comes with a lifetime warranty; the Pax 2 comes with 10 years. Both are very good. -Pax 2 will ship in a day; The Grasshopper is also now shipping on demand. -The Pax 2 has a proven track record of reliability and durability; Grasshopper is still working out kinks. -Overall the Grasshopper is MUCH more powerful and better for glass/bubbler use at home. Both units will work though. -Both the Pax 2 and Grasshopper are good for portability and concealment. 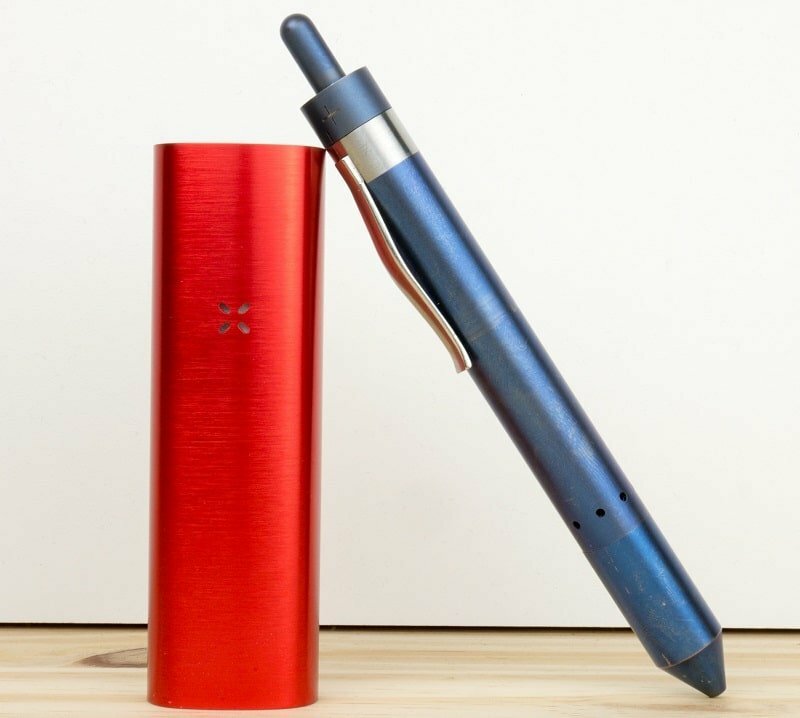 -The Pax 2 is a much better vaporizer to use with groups; The Grasshopper is best with 1-2 people. I recommend picking up the Pax 2 directly from PaxVapor or via VapeWorld and the Grasshopper directly from Hopper Labs. Thanks for checking out my Pax 2 vs Grasshopper dry herb vaporizer comparison and feel free to hit me up on my contact page or in the comments below with any questions about the Grasshopper, Pax 2 or any other vaporizer. *TI vs SS GH: If you’ve narrowed it down to the Grasshopper, the Titanium version will be about 10 grams lighter, provide more resistance to scratches and much more appealing to the eye. The SS is pretty shiny. thanks again for the review ! Hey Eric, I just saw your other comments so I’ll reply to this one. Good choice and all for the reasons you listed. I like the quick heat up time and the powerful heater. Easy to use, no loading techniques, replaceable batteries, and a lifetime warranty! They are caught up to March 2016 preorders last I heard so IF they are actually shipping that fast, that is awesome. I’m not saying they won’t, I’m just saying don’t get your hopes up. Keep me in the loop as I’m sure others are anxious to see if you get it that fast as well. First, love the site. You are providing a great service. I used your site to make my final decision. I ordered my Grasshopper today. Let’s hope it ships within the 3-4 weeks estimate. I wouldn’t bet on it. Hope to not be disappointed as I have just purchased the Ti GH in blue. I got an extra silicone piece and battery just in case. I use a Smok TF-8 Vape for my nicotine and a Fuchai 213W Box Mod. I spent allot of $ getting to a good e-cig and based on your reviews I chose the GH. I hope to skip the beginner level of herbal vaping by purchasing my new titanium grasshopper. I had debated some Arizer models as well and hope I am not settling by choosing GH I hope it serves well and thanks for writing reviews with detail and comparison. I hope to avoid spending extra $ on poor quality products. Hey Kyle, you should be getting your Grasshopper any day now, I would love if you stopped back and let me know what you thought! The Arizer units are also really great vapes, but the Grasshopper shines with the ~5 second heat-up time, the portability/discreetness (both in looks and smell), and also with the lifetime warranty. Ive had the grasshopper for a year now (after waiting two years for it!) and I owned a pax prior. Heres my take-the GH heats fast and for me that’s a big deal, it also gets really hot vapor after a few draws and I shut it down between draws when that occurs (not great, but I can deal with it). The PAX worked well and did what I wanted, but I got rid of it for one reason and that is it took more herb than I cared for in order to “work”, meaning I take maybe 5-10 hits of primo herb to medicate and I’m good. The PAX requires a lot more herb than the GH does in order to operate correctly. I tried the “screen trick” with the PAX but that was awkward and wasteful. I loved the PAX, but it just didnt work well with say “half full”. The GH takes less to operate and even when not filled, works fine. If they ever offered some way or device so that I could use a PAX, half-full – Id go back in a second.